This morning, AJC Political Insider Jim Galloway highlighted the back-and-forth between newly announced U.S. Senate candidate Michelle Nunn (D - Georgia) and WSB-TV reporter Lori Geary, regarding Nunn's voting record. Geary: Have you ever voted for a Republican? Nunn: I have a great deal of Republicans that I think will be a part of this campaign. I’m not just interested in Democrats. I’m interested in all of Georgia, and encouraging independents, Republicans to take a look at my candidacy…. Geary: So have you voted for a Republican? Nunn: I have voted according to my conscience. I probably won’t disclose all of my different votes over time. But here’s what I’ve done, which I think is the most important thing: I’ve worked with Republicans. And I’ve gotten things done with Republicans. I think that’s what people are looking for…. Galloway and Malloy (24 July 2013). Your daily jolt: Michelle Nunn on her voting record, immigration and assault weapons. Political Insider. Retrieved on 24 July 2013. 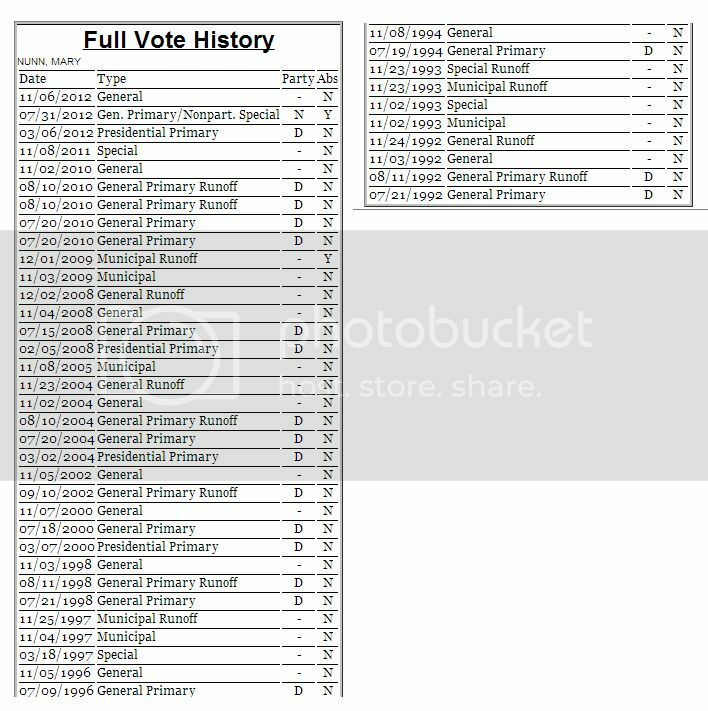 Using the publicly available voter file, Georgia Unfiltered has learned that Michelle Nunn (whose full legal name is Mary Michelle Nunn) voted in only Democratic primaries over the last twenty years.